Only a brief message: this morning at just after 4am my darling darling wonderful incredibly brave daddy drifted peacefully and gently away. My wonderful Mummy was with him, and my sister and brothers, Catherine, Nick and James and myself. He did not suffer at the end and he did have his vintage port. I love you Daddy. Apparently when my grandmother (my father’s mother) was very unwell after having her third child, my uncle, she was advised by her doctor to drink a couple of small glasses of vintage port every day! My darling daddy has remembered this and is quite keen to have some too! It has been a strange old week. I have been in the privileged position many times as a nurse over the last 5 years to witness and support a family through the time when they have to face that treatment and medication is not working for the member of their family who is unwell but I’ve never really believed that I might be on the receiving end of that situation. There aren’t really words to describe that feeling. Holding Mummy’s hand yesterday when the lovely Registrar Barbara told us that Daddy had not responded to the treatment and that they were considering that it was time to just treat the symptoms and make him as comfortable as possible, I felt like I wanted to turn to the doctor and say, “hey, that’s my daddy you’re talking about, that can’t be right, my daddy is going to live forever”. It is a strange and terrible feeling being on the side of the patient and not being one of the professionals supporting the family through it. But this is the junction we are at. Time to make Daddy comfortable. It is a strange time, and feels slightly surreal. You find yourself laughing at things that are funny, even though you feel like you might never find something funny again. But when something is funny you still laugh – chatting to Mummy on the phone this morning as she stayed with Daddy last night, we got the giggles at the visual image of Mummy donning a hospital gown for a nightie and possibly revealing a little bit too much flesh! One really does have to laugh. I had to laugh last night having driven up to London to collect some fresh clothes and also collect my cat Monkey to bring home. Monkey does not like car journeys, what cat does! I don’t like car journeys with my cat. From the second we set off at 10pm to when we arrived home at 1am she kept up a persistant meow literally every few seconds. The microphone picked her meows up rather clearly, so I phoned every member of my family to share her torture with them, although sadly I couldn’t share down the phone the rather unpleasant pong that pervaded my car after she did a poo! She is now sniffing out her new kitchen, and I’m rather relieved Mummy is at the hospital, as she is sitting on the kitchen table. So, I think the plan might be to transfer darling Daddy to a hospice today, or possibly to come home, we shall see. Our darling Luke, his grandson, will soon be on his way down from Glasgow, so we shall all be together over the next few days: Mummy & Daddy, Catherine, Luke & Matilda, Nick & Rita with George, Emily & Bertie, James & Annabel with Cordy and Georgie, and me. We are quite a crowd and in our rowdy way I hope we make our Dad proud. One problem with my old man is that since he’s had cancer one of his main problems is that he has lost his appetite and rarely eats very much – hence becoming so weak and contracting a bad chest infection in the last week. So, we are trying our hardest to find tempting titbits that Dad fancies – on previous admissions Dad has been quite good with hospital food, but not so much this time. For some reason Mummy and my brother Nick are quite happy to polish off anything Dad doesn’t eat on the menu!! We have brought in from home cooked brownies, flapjacks, amongst a host of other snacks, and of course a sneaky box of Lindor truffle chocolates found its way into Dad’s room – a Halfhead favourite – a box normally lasts all of about 5 minutes in our family. Well, Catherine brought these in on Sunday afternoon, and Dad hasn’t really been interested in them, so of course on the sly we have all been merrily dipping our hands in the box and innocently munching away, and the box just about lasted until Monday evening where I must confess Mum, Nick and I finished the last 3! Clearly my training diet is no longer being strictly followed. What happens, this afternoon I have a long chat with Dad about eating and how I know it feels like we are always nagging him to eat this, try that, but it’s only because we want him to regain some of his strength so that we can have him back at home. Suddenly he states he’d like to try a chocolate……I look at Mum and we both collapse in (guilty) laughter as we tell Daddy that um, his grown up family (not the grandchildren) have eaten them all! I hastily ran down to the shop and bought some more, and Dad has happily enjoyed one, he even gave one to his lovely nurse but told Mum and I they were strictly his chocolates. So, not exactly a blog about running today but it’s 4:15am and I thought I’d share my thoughts. A few months ago I did not think that 2 weeks before the start of the Atacama Crossing race I’d be in the position that I’m in today. I thought I’d be champing at the bit putting together my last few race preparations and becoming giddily excited. Instead this past night has found me sitting beside my beloved Daddy in his hospital room, with my mother resting on a hospital camp bed at his side. I had to keep my excitement at Roger Federer coming back in the second set of the men’s US open final very low key…just a silent fist pump. Although the night nurse came in moments afterwards and my darling dad asked me what the score was! And sigh, Federer has now lost…boo! I was meant to work a night shift, it’s odd though, as on a night shift I often long to go to sleep but tonight I’ve just watched darling dad. Yes, I know, I know – I haven’t blogged for ages and you must wonder if I am still alive or even still running. The answer is folks I am well and truly alive, and still trying to run as much as possible, but very sadly I have now withdrawn myself from running the Atacama Crossing in October of this year. 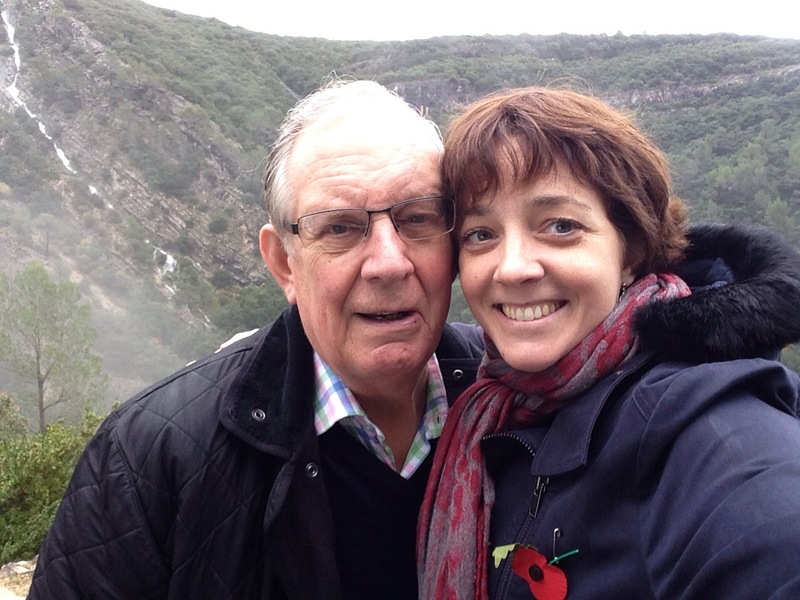 Earlier this year, my darling Daddy was diagnosed with oesophageal cancer. As many people out there know, cancer is the gift that just keeps on giving and shortly afterwards it was discovered that he already has secondary cancer in his pelvic bone. Since full diagnosis my daddy has put up a brave face and been through two different bouts of radiotherapy to help slow down the growth of the tumours and relieve his pain symptoms. He has gone down the slippery slope quite quickly and every day is now precious. So actually taking the decision to stay in the UK and not head out half way across the world to Chile has been relatively straightforward to make. I couldn’t quite envisage perhaps on Day 3 in the desert coming to a halt and wondering why I was there. I am still running but somehow running doesn’t make cancer seem better at the end of the run – I’ve always felt a run improves any problem or dilemma I have, whether it is financial, emotional, career based, solving an argument in my head, but for some strange reason it just doesn’t work quite the same way with cancer!! Strange. My motivation is a little strained at times. I have to drop in hear, for those that may be interested…and I hasten to add that I am still in negotiations with the 4 Deserts organisation (they hold the Atacama Crossing), about refunding some of my race fees. Unfortuntately my father’s prognosis and his obvious deterioration did not really occur 120 days before the start of the race and according to the rules this means that I am not entitled to any of the £2,500 + fees as a refund! Yup, I could be very sarcastic here and say something along the lines of my dad’s cancer should all have happened quicker for me then I could have got something back. But it obviously isn’t about the money and at the end of the day that it is all it is – and if anyone knows me, I am quite used to not really having any anyways! The 4 Deserts have tentatively suggested that they ‘might’ be able to transfer my race fees to a race next year or the year after, but not all of it! That would mean paying additional race fees on top for me – so I am sure you can imagine that if you were asking about how good the 4 Deserts are – at the moment, I’d say I’m not impressed. There are lots of other charges on top of the race fees for their races as well which I have to say the MDS do not have and they are a polished and well run race. Still, as I said, I am still in negotiations and may be I’ll be pleasantly surprised. Out running this morning in the rain that now seems to slyly have vanished into sunshine now that I have gotten home, I did feel somewhat refreshed – but it is the heavy heart that is sluggish to run with. I have a race down in Dorset in two weeks – the Purbeck Marathon – which I am hoping I can switch to their 16 mile challenge…not least because I don’t want to embarrass myself in front of my young man as I stumble last over the line. I’m strong definitely – my training with Luke at the Third Space has been tough, and I have also been training with Jon Stratford of Commando Active at the Albany Club. He trained me for the desert race back in 2012 – and lets say he’s got tougher. And I have to blow my own trumpet here – Gary, my fella, came to watch my training session with Jon last week – I think the words “a little intimidated” were muttered! 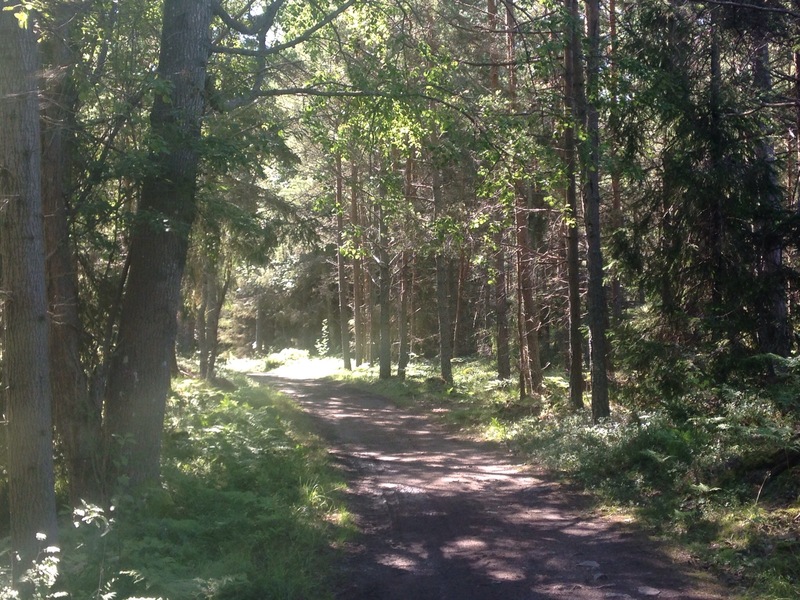 I’m sad to have dropped out of Chile as my training was going well; I even trained at my friend Tim’s wedding (sorry – Boot Camp Wedding) on the Island of Fjardlang in Sweden (see picture of scenery), but you know what, there’s always another desert, but we all only have one Daddy.